Is it possible to dedicate a whole blog post to one bag? Should a single bag get a whole blog post? Yes. Yes is the answer you are looking for in this case. I first saw this bag on the blogosphere a few months back, on someone or other’s fashion wish list. I fell in love with it immediately. Now I don’t deny having a bit of a thing for novelty bags (have you seen my house bag? You can see it here) but this one stood out as being extra-special. I ordered this bag online on Sunday, as my local store didn’t stock it – which at least means everybody in town won’t have it – and it was delivered for Wednesday. Which isn’t bad really for a £2.00 delivery… I couldn’t use it today as it wouldn’t fit in everything I needed, which is a bummer because IT’S SO PRETTY. It’s made out of polyester, but has a leather like look. 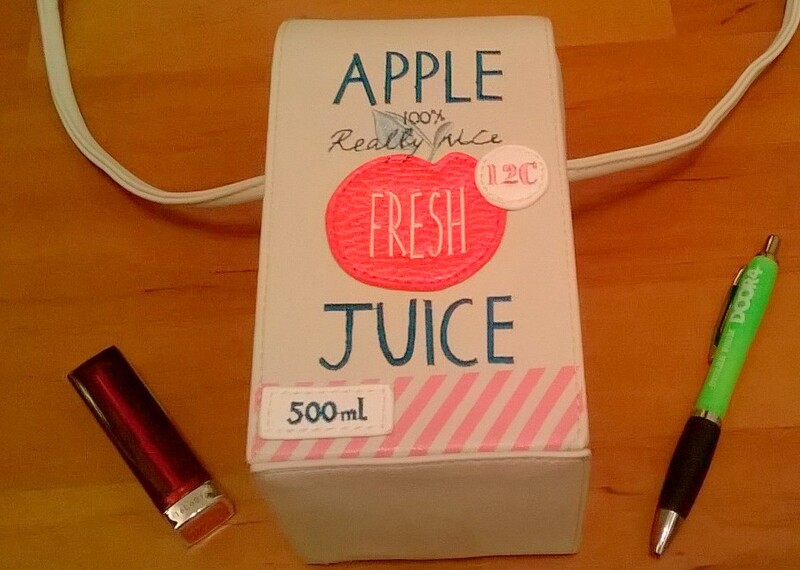 I think one of the nice features of the bag is that apple, price sticker and ‘500ml’ label are all 3d, it just makes it look like its worth a lot more than £29 quid. The top stitching is really neat and cute too. The soft beige colour means that you could, in theory, wear this with everything. Or that’s what I’m telling myself. And trust me; I will be wearing this with everything. My last bag from Accessorize bag lasted ages, so I’m hoping this one will too. The strap isn’t adjustable, but I’m not exactly tall and it reaches just below my hip, which is kinda nice. When I looked at the dimensions online, they did put me off a bit. It’s basically long-ish and thin. I’ve put a lipstick and pen in this photo so you can try and get an idea of the size and depth. I may have to buy a smaller purse, and reduce the contents of my normal bags massively, but for a bag of this amazingness that doesn’t seem like a huge sacrifice. The only thing that lets it down is the fastening – if it can be called that? The bag closes via two metallic strips at the top, and on mine they are off set ever so slightly. This isn’t a big deal but once you notice it, it is a bit annoying. Also it means if you try to just drop your keys in the bag, they stick to the metallic strips. When I showed my sister this bag, the first thing she said was “It’s a bag? It doesn’t look like a bag” she then had to re-iterate to my niece that it is actually a bag. 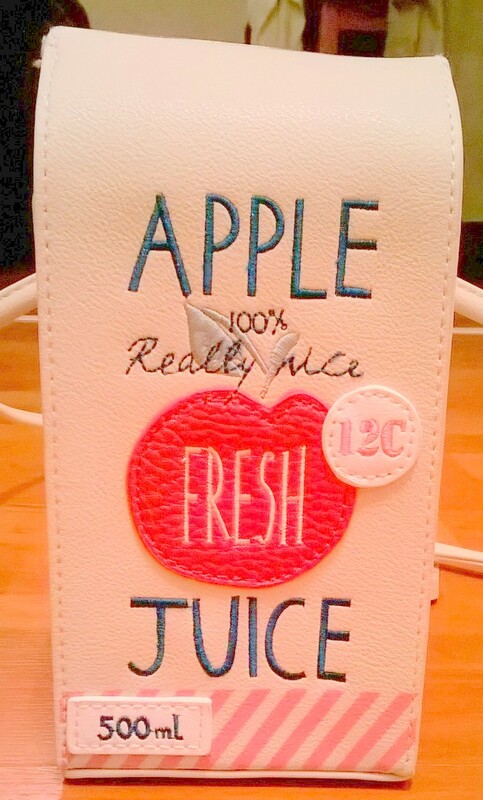 Apparently it is a very convincing stand in for an apple juice carton. If your desired look is for a health-freak, feel free to think of this as a perk. I love this bag, TV stylists love it… so if you’ve been umming and ahhing over whether to treat yourself, do, because you won’t regret it. It’s only a few weeks to pay day, right? 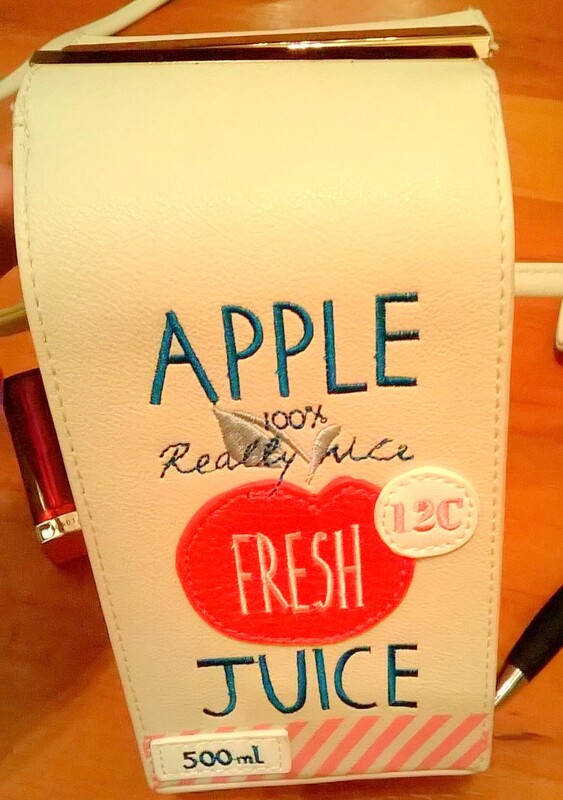 that’s such a cute bag!!! where can I buy this bag?